I guess this is more pertinent now that the election is over. unfortunately the shirts are [temporarily?] 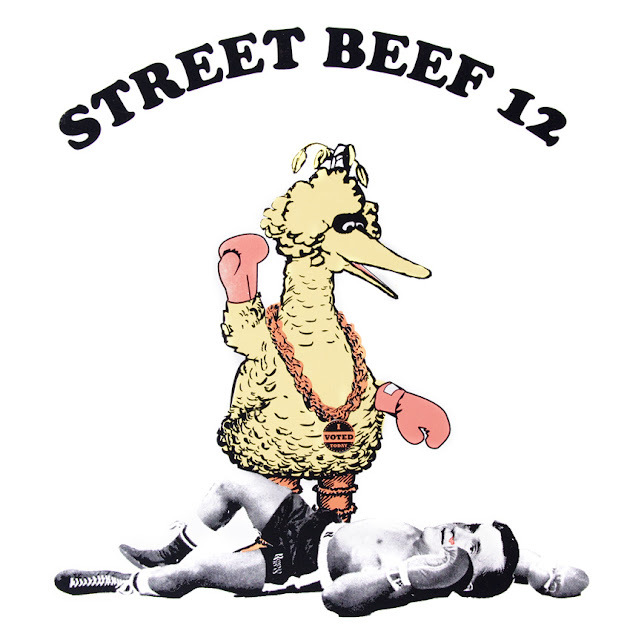 sold out but this "Street Beef 12" Big Bird over Romney poster is still available thru Akomplice. "Its a sure sign of the times that even Big Bird has become political. And now, politicians have targeted PBS–which airs Sesame Street and represents one of our last unbiased news sources–with budget cuts. PBS isn’t wasteful government spending–it’s a public good. The same politicians who want to gut the program would use the savings to give tax cuts to the rich, adding to the already dangerous concentration of wealth in the world’s top one percent. But as the 99 percent, we are the Big Birds of the world. We’ll fight to keep the money on the streets, where it belongs, and to put knowledge in the hands of every citizen, not just the fortunate few."